Our round bar bench is perfect for parks and playgrounds and has been used by councils for many years. Featuring a rounded edge, the round bar bench is comfortable to sit on. The round bar seat is made from British steel where it is hot-dipped galvanised to prevent rust. The seat is then powder-coat to prolong the longevity of the paintwork. The seat is available in any RAL colour. 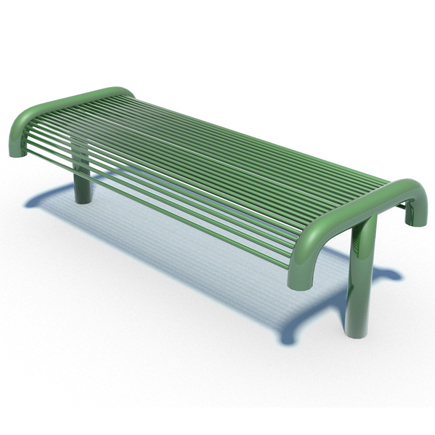 The strong structure ensures the seat is able to withstand high usage and any vandalism. The seat can be installed straight into grass using extending legs with anchors, or can be bolted down into an existing concrete pad. If needed, we can also price for a suitably sized concrete pad if one doesn’t exist. For more information contact us on 0114 282 1259, email info@lightmain.co.uk or fill out our contact us form.